Your spiritual evolution wouldn’t be attainable without healing yourself first of the trauma and pains you’ve been accumulating through your life. In fact, that’s one of its biggest steps, to acknowledge your pain and heal your inner wounds. Once you embark on your healing journey, things start to get better and brighter. And it’s not only because you’re enjoying the benefits of healing, but also because the mere decision of healing yourself already raises your vibration. This, in turn, affects the energy you share and raises the vibration of everything and everyone around you. In other words, you’re already making a difference in the world as you heal yourself in your own little way. 1. Your healing creates a ripple effect. When reaching out to others for healing you’re lifting yourself out of the darkness, in which many are held captives. Doing it creates a ripple noticeable by others. Your effort inspires others to take action, seek help and lift themselves up from their darkness. Soon they will contemplate healing themselves too. 2. You unconsciously assist others in their own healing. You’re assisting others in their own healing without your awareness. As you take steps to heal yourself you pave the road for someone else to follow and take the same steps to heal themselves. 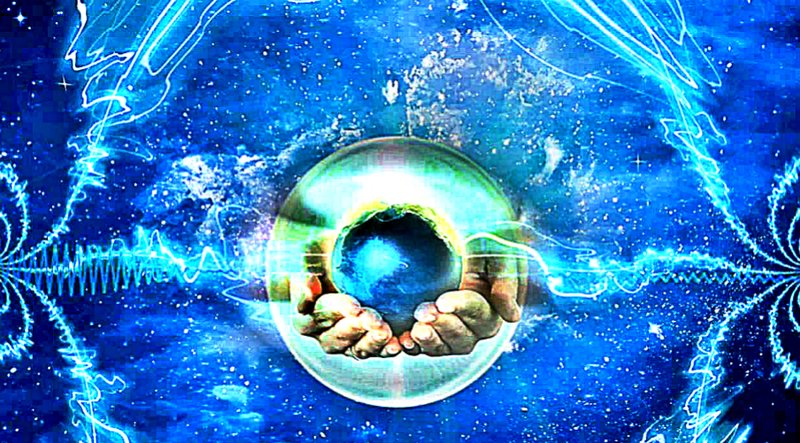 Your energy imprint has a multidimensional effect that you’re unaware of at the moment. 3. Your ability to heal yourself raises the vibration of others. It takes a lot of courage to face your own wounds and heal them. Doing so means you have to go through the pain, feel it and let go, releasing its grip it has on your subconsciousness. This will lift your vibes and affect anyone who interacts with you positively. Your triggers will dissolve and you will act from a place of love. 4. You’re allowing greater opportunities to manifest. As you keep healing yourself, you’re allowing yourself to grow and expand. This invites greater opportunities to manifest, and at the same time, raises the vibration in your surroundings. As you start perceiving greater options and possibilities for your dreams to come true and take action, you will keep raising the vibration of your own reality. 5. You’re spreading the value of trust. You know that time is an illusion and you’re not in a hurry. You believe that the right things will fall into place at the right time. Your dreams may not be visible at the moment, but you believe that they will be given to you when you’re ready for it. This projects ultimate trust and others can sense it. It will give them freedom to have faith in something bigger than themselves. 6. You’re open to showing your warrior spirit. As you heal yourself you cannot escape but to face your fears. In fact, that’s a part of the healing process. And as you face your fears you awaken your warrior spirit. Even if other people don’t share your perspective, you continue to stand up for what you believe in. You faced your worst fears, embraced them, and freed from them. They didn’t stop you from standing for what you believe in. You’re a warrior and you’re not afraid to show it. Others see this and get inspired to stand for what they believe in, to be courageous and face their own fears. As they keep facing their fears they are dissolving the darkness that’s within them. 7. You’re becoming patient and tolerant of differences. Others feel comfortable in your presence because they know that when they’re with you, there will be less friction. Because you accept yourself as you are, you accept others as they are with all their differences and uniqueness. This makes it easier for others to accept themselves with all that they are. You give them the freedom to be themselves. 8. You’re allowing others to heal and grow in their own time. Though you know that the best time to heal is now, you don’t impose it on others. You respect their individuality and allow them to heal and grow in their own time. This allows the energy to flow freely and smoothly. It gives them the freedom to walk their own journey and learn their own lessons. 9. You’re teaching others to embrace all emotions. Healing involves allowing all the emotions you feel to flow freely within you. You’re aware that there are days when you don’t simply feel okay. That there are things that provoke you and make you angry. Things that make you feel sad and vulnerable. Rather than resist these emotions, you allow them to be because it’s the only way to let them go and flow. You understand that each emotion is for you, not against you. Even the so called negative emotions have a purpose to protect you and your boundaries. Because you’re in control of your emotions, people around you don’t suffer from any emotional outburst and low vibration energies that you might have otherwise created. You allow all emotions to flow freely and this teaches others that it’s ok to feel what they feel. 10. Your higher vibrations create ripples that benefit others. Every small thing that you do out of higher awareness will soon accumulate into something bigger that will become a treasure for others. No matter how small your actions may seem, continue doing them because The Universe recognizes them. Vibration is the language of The Universe and everything within it. Your healing is an instrument in making this world a better place to be.